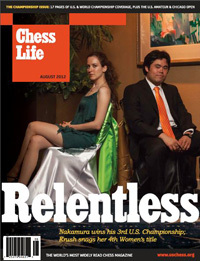 We have exciting news for all the subscribers of the US Chess Federation's flagship publication: Effective with the August 2012 issue of Chess Life, available now for USCF Members via the online viewer or pdf download at uschess.org, the USCF's flagship magazine is in full color after six years as a two-color publication. The magazine will be arriving in Premium Members' mailboxes soon. A few items have been added to take advantage of the new look:"Faces Across the Board" (p. 9) by Al Lawrence will celebrate class-level players who have a chess accomplishment of note or interest. "Knight's Tour" (p. 46) is a tournament travel section that will highlight one or more of the events in each issues' Tournament Life section. "My Best Move" (p. 72) will look at a chess, business, or celebrity personality each month and ask them to describe either their literal or figurative best move. Daniel Lucas, USCF Director of Publications, says, "We hope you enjoy Chess Life's refreshed design and the same great chess coverage you've come to expect. If you would like to be featured in "Faces across the Board", please email facesacrosstheboard@uschess.org. If you are an organizer who would like to have their event featured in "Knight's Tour", write to letters@uschess.org. If you wish to suggest someone for "My Best Move", write to letters@uschess.org." Two-time US women's chess champion Jennifer Shahade is the Chess Life Online editor.